Use REPORT calendar-query with the correct comp-filter (for instance, comp-filter name="VTODO" for syncing VTODOs) instead of PROPFIND. Fetch the MIME type of each resource, too. Filter the result by MIME type. For instance, when the query was for VTODOs, ignore resources with MIME type text/calendar; component=vevent. Now I’m looking for help to test various services and servers for their REPORT calendar-query support and whether they return component values in getcontenttype. Any volunteers? Which competency level is required for helping to test this? I also use OwnCloud, but not a self-holsted version, and I’m not sure where to find the calendar-query responses/data. Create a calendar with events and TODOs. Send the request to your DAV server: curl -u user:password -vX REPORT --data @report-events.xml -H 'Depth: 1' https://path/to/your/calendar. The response should comprise only VEVENTS. Replace the comp-filter VEVENT by VTODO and try again. The response should comprise only VTODOs. See the linked RFC for details about the syntax. You may vary the request to play around with other filters, for instance Partial Retrieval of Events by Time Range. Does the server support REPORT calendar-query or does it return error messages? Are calendar-query results correctly filtered by component type (VEVENT/VTODO)? Are calendar-query results correctly filtered by time range? It returns results. There are no error messages. When the comp-filter is VEVENT it only returns VEVENTs. When the comp-filter is VTODO it only returns VTODOs. Both VEVENT and VTODO queries can be done with filters like <C:time-range start="20141012T000000Z" end="20141015T000000Z" />. The results are correctly filtered. Thanks for testing oC 7.0.2 already, @dper . I don’t have a different server, so I’ll pass. Confirmed to work with Baïkal 0.2.7. Successfully tested filtering (only) VTODOs by date range. I can’t download the apks from the Mirakel releases page – I just get a directory error. Does anyone by chance have an alternative place I could find the most recent Tasks-compatible Davdroid release? Thanks VERY much. Hah – yeah that sounds like my luck – thanks for letting me know, and glad to be sure I have literally the bleeding edge copy! If I try to sync it with an open xchange server, the “davdroid” app just closes, in the moment it tries to sync the tasks (contacts and appointments are working). Filtering by VTODO and VEVENT runs fine on 0.8 and 0.9. @rfc2822: i see this is the only open issue on the next milestone - when do you expect to release it ? 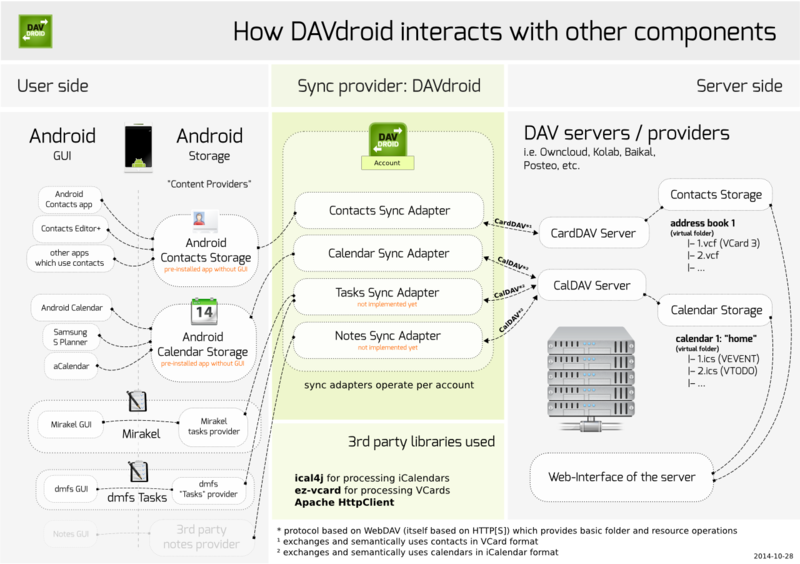 We’ve already discussed this in more detail internally, however this is more complex than we expected in early days of DAVdroid. The milestones need to be adjusted - they don’t reflect the current plan. There also needs to be re-coding some of our core components. But be asured, we will be getting there… Tasks are still a high priority feature that we want to get in. But first we have to introduce a basic settings dialogue which will be the next (bigger) feature for DAVdroid (which is also necessary for future features like tasks). I’ve attached an image that illustrates the sync process and the involved components and how they play together. Tasks are also part of it, but since there is no standard storage for tasks it’s hard for DAVdroid to hook in at a certain position. I know it’s easy for me to talk, but I’m sure both the Mirakel devs and dmfs have the same goals, which is why I think it’d be in everybody’s interest to unify both task providers, no? Also, what in iCalendar would you use to represent notes? It’s not just Mirakel and dmfs… In a more general way of thinking it would be the best to have a standardized backend which can be used by different sync apps. It was always our intention to be an app that is compatible with a lot of services. A very nice solution would be a new generalized tasks storage app/proxy which DAVdroid could use to sync data instead of making workarounds for different apps that provide tasks. At the moment (we’ve not finished thinking about it!) we’d use VJOURNAL for notes and VTODO for tasks. Thanks for your answer. I think a general-purpose task storage is/was @dmfs’ goal.